Pet Partners is proud to register nine different species for therapy animal work in the United States and Canada. Although the majority of our teams are dogs, we also register cats, equines, rabbits, guinea pigs, llamas and alpacas, birds, miniature pigs, and rats. Currently, only canines are registered outside the United States and Canada. Are at least one year old at the time of evaluation, or six months old for rabbits, guinea pigs, and rats. Have a young animal? See our tips for preparing for future therapy work. Have lived in the owner’s home for at least six months, or one year for birds. Be currently vaccinated against rabies. Rabbits, guinea pigs, rats, and birds are exempt from this requirement. Titres are not accepted in lieu of vaccination. May not be fed a raw meat diet. Have no history of aggression or seriously injuring either people or other animals. This includes animals who have been trained to aggressively protect and/or have been encouraged to bite, even if it is a component of dog sport, such as Schutzhund. Welcome, not merely tolerate, interactions with strangers. Be comfortable wearing Pet Partners acceptable equipment. Animal welfare and infection control are key principles of the Pet Partners Therapy Animal Program. Asking animals to make therapy animal visits when they are not healthy increases stress and can lead to a worsened condition. Additionally, you may visit clients with compromised immune systems who would be at risk for transmission of zoonotic diseases. If your animal is taking antibiotics, antifungals, or immunosuppressants (including steroid and chemotherapy medications), they will be unable to register and visit until they have finished treatment. Pet Partners does register some animals with disabilities. To be eligible for participation, the animal should be able to clearly express consent, actively participate in a visit, and not experience an aggravation of their medical condition as a result of volunteerism. If you are interested in registering with an animal with a disability, please contact us so we can discuss the specifics of your particular situation. Read their animal’s particular body language and recognize when their animal is stressed, anxious, concerned, overstimulated, or fatigued. Demonstrate positive interactions with their animal by praising, cueing, encouraging, and reassuring the animal as needed. Cue or redirect their animal without raising their voice, forcefully jerking on the leash, or offering the animal food or toys. Make casual conversation with those they meet on visits while still being attentive to their animal. Guide the interactions of others with the animal in a professional and polite manner. Advocate for the safety and well-being of their animal at all times. Pet Partners works with handlers with disabilities, including those with service animals. If your disability may require accommodations to the evaluation, please contact us and we’d be happy to discuss the specifics of your particular situation. You may volunteer with the animal of a friend or family member, as long as you have known and been working with the animal for at least six months (or one year for birds) and have the permission of the animal owner. 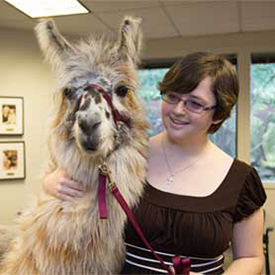 Effective therapy animal teams are based on a strong bond between the handler and animal. Pet Partners relies on handlers to have a strong relationship with their animal so they can read body language and signals that their animal may be tired, stressed, anxious, or fearful and then support them accordingly. Pet Partners relies on a combination of registration fees and donations to provide our volunteer services, including Pet Partners’ liability insurance, continuing education programming, and qualified staff who advocate for and educate about the Therapy Animal Program. Your registration fee covers only one-third of the costs to provide these resources for your two-year registration. The rest of your support comes from generous individual donors (including Pet Partners volunteers), foundations, and corporate partners. After you’ve reviewed all the basic requirements, this is the question that will truly determine your ability to become a successful team. Therapy animals must inspire confidence in those they meet, so they should consistently demonstrate that they’re well-behaved and have good manners. The three terms Pet Partners uses to describe this desired behavior are reliable, predictable, and controllable. When you can predict your animal’s reactions, you can take action to ensure a reliable response and maintain control of your animal in any situation. When clients and facility staff perceive that you’re in control of your animal, they’ll have confidence in you and your animal when you come for visits.